THIS WEEK’S OTHER FEATURED BOOKS, “THE MOTEL OF THE STARS,” BY KAREN SALYER McELMURRAY AND “A DIFFERENT JESUS,” BY JAN LINN, CAN BE FOUND BY SCROLLING DOWN BELOW THIS POST. SUMMARY: Margo Kerber has endured difficult years battling infertility while trying to sustain her good marriage and satisfying career. When a seemingly miraculous pregnancy ends in a late miscarriage, Margo is devastated. For a time, the unshakable yet false belief that she is pregnant again provides relief from all-consuming grief. When her fantasy inevitably clashes with reality, Margo falls into a deep depression requiring admission to a psychiatric unit. Uncertain if the sometimes chaotic environment there is helping or making her worse, she seizes an opportunity to flee. Alone on the city streets, new fantasies propel her to commit a crime with dangerous consequences for herself and others. Written by a prominent psychiatrist, this stirring portrait of one woman’s psychological unraveling takes readers on a journey across the blurred boundaries between sanity and depression, madness and healing. THE BACK STORY: I wanted to tell a suspenseful story that draws the reader in and gives them an intense experience . I also wanted to show that patients with serious psychiatric illness are not that different from the rest of us, and to show psychiatry and psychiatrists at work in a more realistic fashion than is usual in fiction and film. WHY THIS TITLE: It indicates the story will have a trajectory and move from a time of serious problems to one unexpected ‘miracles’ that overcome them, and then to a time without shields or rescues from the harsh realities of life. WHY SOMEONE WOULD WANT TO READ IT: From the reviews by its readers: it provides an “exciting page-turning read”, a “fascinating insider’s look at psychiatry”, “vivid and sympathetic characters”, and is “beautifully written and thoughtful”. “Monica Starkman offers a penetrating look at the drastic capabilities of the obsessed mind. 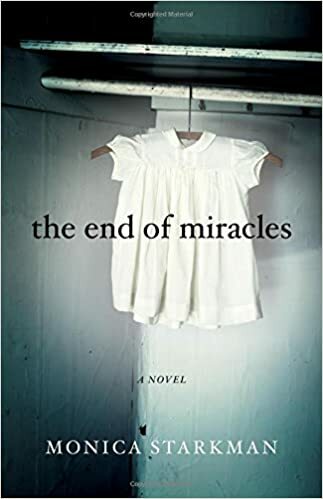 Written beautifully and carefully, at just the right pace, The End of Miracles is a thoroughly compelling piece of work.”—Roger Rosenblatt, New York Times bestselling author, literary editor of The New Republic, essayist for Washington Post and Time magazine. “Starkman, a prominent psychiatrist, beautifully captures one woman’s journey through depression in this superbly well-written and gripping first novel, which powerfully reveals the complexity and strength of the human mind.”—Booklist. “For Margo Kerber, the novel’s stoic and sensitive protagonist, the path to motherhood has been troubled from the start. An unexpectedly joyful pregnancy (is) followed by a miscarriage. Afterward, when Margo’s body produces false pregnancy symptoms and cruelly tricks her again, it is clear that she’s been driven to a breaking point. Margo’s collapse, unraveling, and gradual recovery bring a conclusion of forgiveness and hope. Best of all is Starkman’s portrait of Margo―a flawed yet admirably strong victim of circumstance and biology who refuses to be a victim anymore.”—Foreword Reviews. SAMPLE CHAPTER: See the book’s Amazon page. AUTHOR PROFILE: Dr. Monica Starkman is a psychiatrist who is a faculty member of the University of Michigan Medical School Department of Psychiatry in Ann Arbor, Michigan. She is a clinician and a scientific researcher. Many of her publications in the scientific literature highlight concerns and conditions of women, such as the first study of women’s reactions to the use of fetal monitoring during labor. She has served on the editorial board of the Journal of Psychosomatic Obstetrics and Gynecology. She is a recognized expert on the effects of stress hormones on mood and on brain structure. Dr. Starkman has also published in The New Republic and Vogue magazine. Dr. Starkman writes regularly for Psychology Today as one of their Experts.